« How Long Will Your Bike Last? My ride had a purpose on this weekday in Silicon Valley. When most were driving to work, I was out riding, meeting an acquaintance from the bike shop days. Gebhard Ebenhoech has been a cyclist and bike shop owner most his life, starting in retail at age 13. His life (and mine) has been a rollercoaster of late. After a few dips, he’s climbing back and will manage a pro shop opening in Redwood City (more to come). As we traded stories, it was more about Silicon Valley than about bikes. He knows as many techies as I do. But I’m not surprised. Many techies are cyclists too. The two go together, like wine and baguettes. 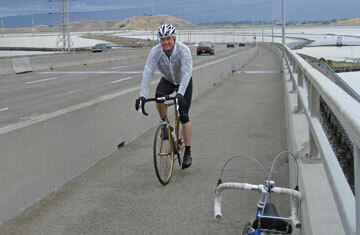 Under gray skies, I suggested we ride over Dumbarton Bridge and avoid the rain. We made our way east through Palo Alto and before we knew it we were riding over the bridge, which has a separated bike lane. Once again, I broke a front brake cable, only this time it was not a disaster. I stopped and moved my rear cable to the front brake. Note to self — change cables annually. Along the way on the Hwy 84 frontage road, I told Gebhard about my chance encounter with a cyclist here one day in late 1982. We struck up a conversation and before I knew it he was inviting me to his office at Xerox PARC (Palo Alto Research Center). I think you know where this is going. The cyclist showed me his computer. “This is a mouse,” he said. He proceeded to show me the intuitive user interface. “We’ll all be working this way one day,” he said enthusiastically. Yes, because Steve Jobs saw the same demonstration in 1979 and the rest was history. The Apple Macintosh (and Lisa) was born. I would buy an Apple IIe and later a Macintosh SE, which was the genesis for Bay Area Bike Rides, thanks to MacDraw. This entry was posted on May 13, 2010 at 2:44 am and is filed under Ride reports. You can follow any responses to this entry through the RSS 2.0 feed. You can leave a response, or trackback from your own site.